This A.M. I declare that pumpkin is so totally last year. 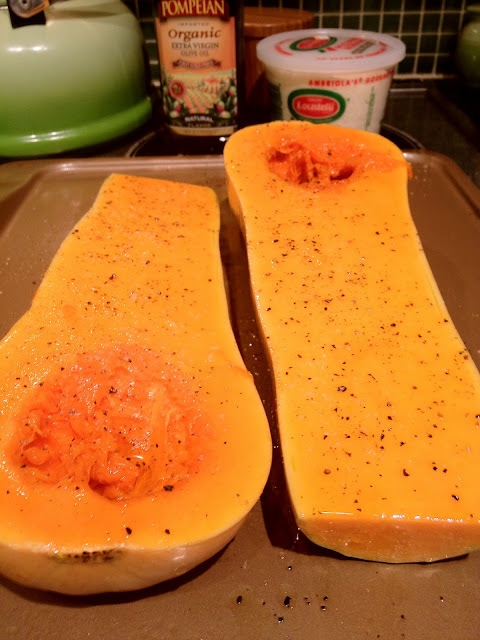 The winter squash that has won my heart and is my current obsession is butternut squash. It yields a very unique sweetness when roasted and is similar taste and texture to pumpkin and in my opinion, is more flavorful and . When I think about cooking with pumpkin or butternut squash, mixing sweet with savory flavors always comes to mind. So that is exactly what I set out to do when making my roasted butternut squash soup. Cut squash in half lengthwise. This is best accomplished with a large serrated knife and a man doing the cutting (preferably the body builder type, but I suppose your husband or boyfriend will work). Coat each half with olive oil, salt and pepper and place cut end down on a parchment paper lined cookie sheet. Bake at 350 for 1 hour, remove from oven, carefully flip squash over with tongs and allow to cool. While the squash is cooling melt butter along with shallots, garlic, carrots and a dash of olive oil in a stock pot. Saute until softened, about 10 minutes. Scoop seeds and fibers from the squash, reserve for later. Scoop the meat out of the squash and put in the stock pot along with the vegetable broth, spices (don't salt until the very end though) and brown sugar. Bring to a boil, then reduce to a simmer and cover. In a small pot boil the seeds and fibers with the extra cup of vegetable stock until the liquid is reduced by half. Strain the mixture into the soup along with any sweet squash drippings that were rendered on the parchment paper when baking. Let the soup simmer for 30 minutes, stirring occasionally. Next blend the soup with either an immersion blender (easiest), blender or food processor until silky smooth. Return to pot, add heavy cream and taste test to see if any salt needs to be added. The soup is now ready to be served! Check out different topping ideas below. Look so Delicious :) Thanks!